As the Upper West Side developed in the late 19th century, architects adorned its streets with rowhouses and commercial buildings in stark contrast to their counterparts across Central Park. Unlike the correct homes of Manhattan’s wealthy along Fifth Avenue and its side streets, the middle- and upper-middle class residences here sprouted gargoyles while colored beams of light from stained glass overlights spilled onto parlor carpets. Whimsical carvings of “green men” and birds, entrance stoops that split or turned to one side or the other, and great oaken doors pretending to be medieval made a stroll through the residential neighborhoods delightful. Speculative developers built rows of homes as a harmonious string; each individually-designed yet forming a unified whole. Among these were the Flemish Revival houses built by Gerald L. Schuyler in 1894 along West End Avenue between 83rd and 84th Streets. It was a time when the architectural style was enjoying popularity on the Upper West Side. Three years earlier construction had begun on the West End Collegiate Church nearby, modeled after a Dutch guild hall, and a block north of Schuyler’s row Richard G. Platt threw up another group of wonderful Dutch houses. No. 489 West End Avenue was a wide brick-and-brownstone residence nestled among Schuyler’s row. Entered through an offset doorway, it sat on a solid brownstone base above a shallow English basement. Red bricks formed rusticated piers on either side of the central portion, where windows on the second and third floors were framed in brownstone. Two sturdy fluted and banded stone columns added interest to the third story openings. Above, a rather lackluster stepped gable with brownstone finials fronted a tiled mansard roof. Hubert Howson and his pregnant wife Helen Abbe Howson purchased the house prior to its completion. As was common, the deed was filed in Helen’s name. The pair moved in with their daughter, along with Helen’s brothers, William and Truman Abbe; although both were actually away attending Harvard. That same year Hubert Abbe Howson was born in the house. Hubert Howson was Treasurer of the West End Collegiate Church—which at the time had the ungainly name of the Collegiate Reformed Protestant Dutch Church of the City of New York. The Howsons continued to open its home to other family members. Helen’s surgeon brother, Robert Abbe, and his wife, who had been living at the enviable address of 11 West 50th Street, listed their address here in 1899. Mrs. Abbe was an educator who became noted for founding The New York City History Club. Despite the sale, the family continued to live on in the comfortable home, apparently now renting from Baudoine. As war clouds formed over Europe, 19-year old Hubert went off to the Federal Military Training Camp in 1913 where he would stay for three years. At the same time, his sister became secretary of the Needlework Guild of America. The organization’s purpose was “to furnish new, plain, suitable garments to meet the great need of our hospitals, homes and other charities and to supply a channel through which all persons may work in unity for this object.” Unlike most similar charities, the Needlework Guild accepted “men, women, and children of all classes” as members. The Howsons remained at No. 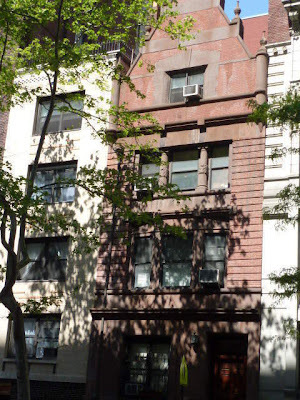 489 West End Avenue through the Depression; then in 1938, Mrs. Henry Harrison Boswell purchased the house. The widowed Mrs. Boswell had established “Mrs. Boswell’s Residence” in 1916 for young female students away from home “pursuing special subjects under private teachers or in New York City schools.” Upon converting the Howson home into the new Mrs. Bowell’s Residence, she advertised it as “Conveniently reached from the east and west sides of the city. Excellent cuisine and service. Chaperonage when desired.” The Boswell Residence remained in the house for at least a decade. The first major change to No. 489 West End Avenue came when, in 1962, the basement and first floor of the house were converted for use as a synagogue for the Congregation Beth Midrasch. The floors above were reserved as a single-family dwelling. Then in 1989, the last remaining house from Gerald Schuyler’s Dutch-inspired row was converted into apartments. While not the most architecturally-significant building on the Upper West Side—one critic deemed it “tepid”—the Howson home is a quaint reminder of a much different neighborhood along West End Avenue.